Do you ever have those moments where you’re seriously craving a big refreshing salad? Now I’m not talking a flimsy salad with a couple of pieces of ice berg lettuce and some soggy tomatoes. No not that kind of salad. I’m talkin’ a hearty, refreshing, meal-size salad, similar to the fancy salads you might get at a restaurant. Think vibrant and juicy fruit, crunchy nuts, flavourful cheese, and a dressing that’s to die for. And then of course, you have the option of adding the protein like the grilled chicken or salmon fillet. These are the types of salads that ALWAYS hit the spot! Lately, I’ve been having this reoccurring craving for this type of salad…probably because it’s summer which means there’s less desire to use the hot stove, and MORE desire to eat those hydrating and seasonal fruits and veggies. As I’m sure you’ve figured out by now, whenever I’m craving something, I make it my personal mission to reinvent the recipe so that I can eat it. ALL. THE. TIME. 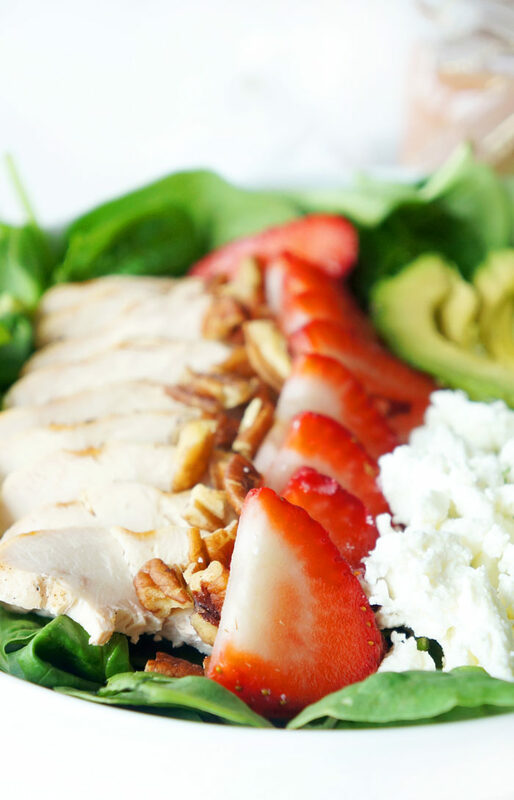 Like this grilled chicken strawberry avocado salad with a strawberry balsamic dressing. 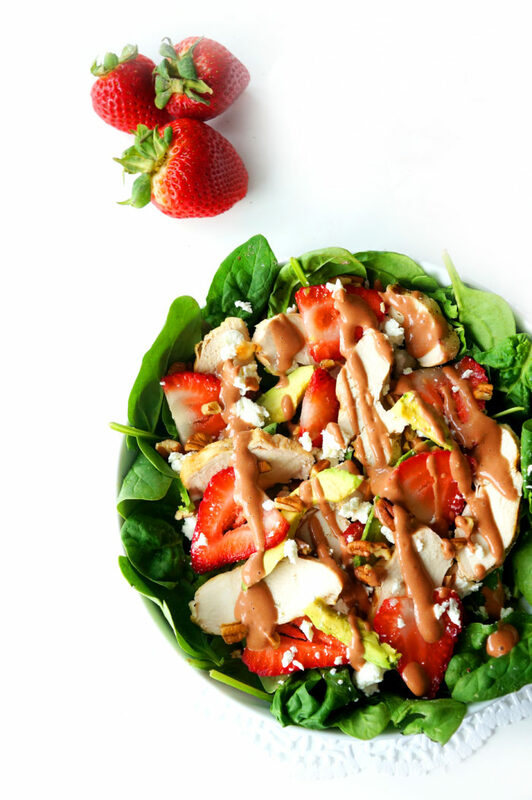 The idea for this strawberry dressing actually stemmed from my blueberry broccoli salad recipe with the blueberry balsamic dressing. This is my favourite salad dressing of all times. So creamy, sweet and delicious! And then, when I was brainstorming other flavour combos to pair with it, I immediately started dreaming of juicy strawberries, creamy avocado, and little bits of goat cheese and crunchy pecans scattered throughout. Then of course, the grilled chicken automatically promotes it to lunch or dinner status since it adds that filling dose of protein and compliments those other flavours so nicely. To do this salad meal prep style, I recommend making up a batch of the dressing at the beginning of the week (love doing this in my Magic Bullet) and storing it in the fridge. It makes a whole bottle’s worth, so it will definitely be enough for more than one salad. And while you’re in meal prep mode, grill up some chicken breasts in a batch and slice them up to store in the fridge so that you have quick and easy access to protein throughout the week. And then, all you have to do is assemble the salad like so and pour on that mouthwatering dressing. It makes life so much easier when you take a bit of time to do the prep work in advance. Believe me, my super active 6 month old reminds me of this every day when I go to make dinner. Do as much as you can beforehand so all that you have to do when dinner time rolls around is assemble, assemble, assemble. I’m especially loving this salad for summertime because it makes such a light and healthy dinner or lunch, perfect for those hot days. I love how it’s packed full of all the nutrients necessary for a balanced and healthy meal. 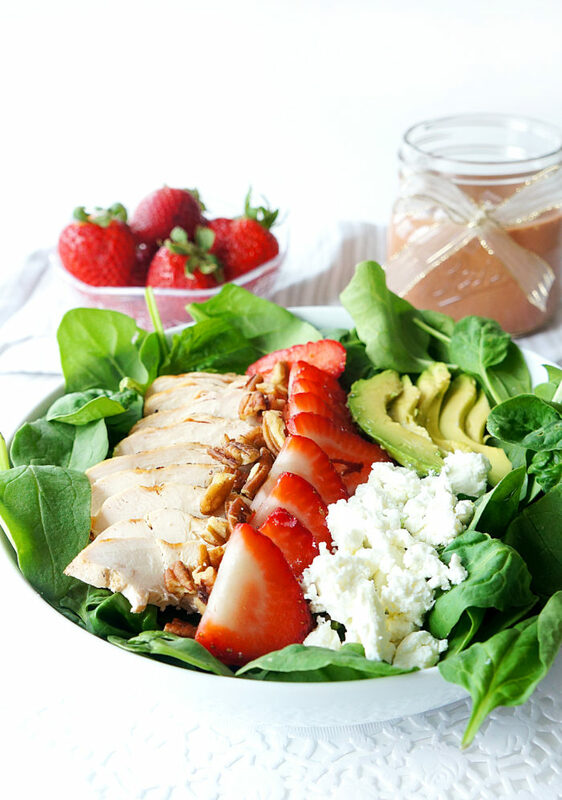 Protein and iron from the chicken, some carbohydrates and vitamin C from the strawberries, and healthy fats and vitamin E from the avocado, pecans and olive oil based dressing. And we can’t forget about that vitamin K, vitamin A and potassium from the spinach. You really can’t go wrong with this bright and vibrant nutrient-packed salad! Season chicken breasts with salt and pepper, if desired. Add chicken to the grill and cook 6 minutes per side or until cooked through. Meanwhile, toss the spinach, chopped pecans, crumbled goats cheese, sliced strawberries, and avocado together in a large bowl. Once the chicken is cooked, slice it thinly and add it to the salad. Pour desired amount of dressing over the salad and toss to combine (the salad dressing recipe makes a full bottle's worth so I used about a quarter of the dressing for this salad recipe). Divide among four bowls and devour! That’s a great salad I would eat every day with pleasure! Lovely dressing, too. This is a staple taste of summer! It is one of my most favorite salads! This is the perfect salad for summer! So fresh and delicious! Thanks Zainab! 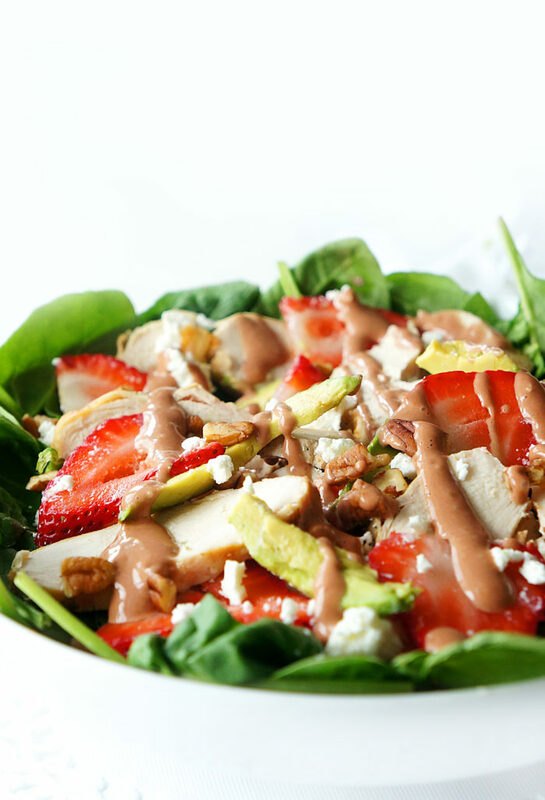 This salad has been on the weekly menu rotation…so good! I need this salad in my life, stat!!! I agree Tina! Everyone needs this salad in their life! This is definitely my kind of salad! 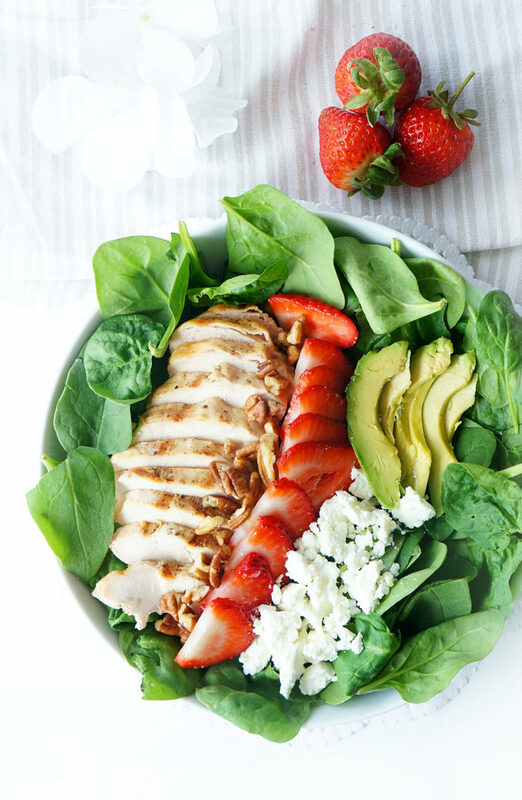 I love the combo of grilled chicken, avocado and strawberries. Can’t wait to recreate it! Oh I totally agree Kim — one of my favourite flavour combos of all times! Hope you enjoy the salad if you have a chance to try it out! 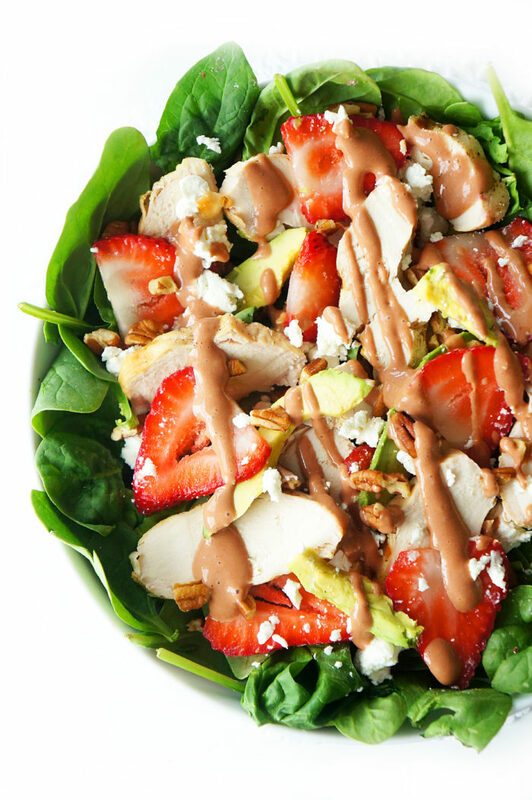 Your strawberry balsamic vinaigrette sounds delicious! Can’t wait to try it! Thanks Courtney! 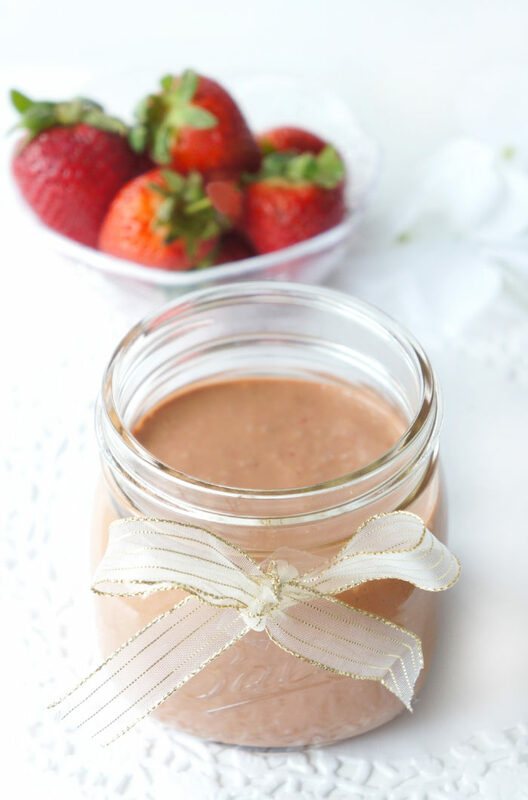 It’s one of my favourite homemade summer dressings! Grilled chicken is my favorite way to eat chicken. I’m in love with the dressing which makes this dish best ever chicken salad. 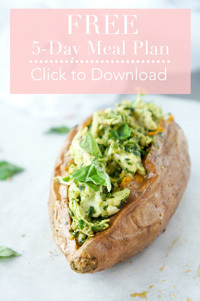 I’m definitely giving that dressing a try, it looks great!